FRANCE – La Terne - Cette semaine, les deux prospecteurs qui œuvrent pour le service régional d'archéologie - mais sont bénévoles - ont fait une découverte d'envergure du côté du village de La Terne, sur le chantier de consolidation de la RD 32, derrière le moulin. Un mur d'origine gallo-romaine en état de conservation exceptionnelle, percé d'un système hydraulique, deux aqueducs. « Lorsque nous avons su qu'il y avait des travaux sur le mur de soutènement de la route, nous sommes rapidement venus. On se doutait bien qu'en grattant un peu, on pourrait découvrir des choses », sourient les deux hommes. Car le secteur autour de La Terne n'est pas avare de découvertes liées à l'époque gallo-romaine, surtout depuis deux ans : un sanctuaire sur la commune de Fouqueure, ailleurs un aqueduc, des éléments de colonnes… « Mais essentiellement des éléments disséminés. Rien d'aussi spectaculaire que ce nous venons de mettre à jour. » L'ouvrage date du 1er ou IIe siècle, « selon les céramiques que l'on a trouvé. » La présence des deux aqueducs dans le mur a vivement intrigué les deux hommes. « L'un d'eux, à l'intérieur, sur sa base et sur les parois latérales est recouvert d'une espèce d'enduit. Il devait servir à transporter l'eau. Dans l'autre, en revanche, cet enduit n'existe pas. Il devait servir d'égout. » Pour le moment, environ 7,50 m de mur ont été découverts, « mais nous sommes à peu près sûr qu'il doit continuer sur toute la longueur du terrain où il se trouve, soit une trentaine de mètres. » Ce qui laisse à penser que le bâtiment antique dont ce mur est le vestige était d'une taille très importante. « Et nous n'avons pas creusé pour voir à quelle profondeur peuvent être les fondations. » Et quelle pouvait être la destination de ce bâtiment ? « Peut-être un bâtiment portuaire », glissent les compères. Une suggestion qui accréditerait la thèse qu'à l'époque gallo-romaine, La Terne aurait été une cité et un port fluvial d'importance. « On pense qu'à cette époque, la Charente coulait plus bas. Trouver les fondations de ce bâtiment pourrait nous donner une idée. » Mais « ce ne sont, pour l'instant que des hypothèses de travail », admet Claude Brège. Pour en savoir plus, il faudrait que la décision d'entamer une campagne de fouilles soit prise. IRLANDE – Tory Island - The first archeological evidence of human occupation on Tory dates from 2,500 BC when neolithic farmers arrived. Excavations have shown there was once a dolmen on Tory but it was demolished to provide building materials for a wall close to where the island’s lighthouse now stands. The case study reveals how the islanders’ search for fuel has helped shape the archaeological picture of Tory’s history. As the once plentiful peat bogs were stripped, ancient field boundary walls and other historical features began to emerge. Stripping back the peat bog also revealed a line of stones, believed to have been contemporaneous with the Dolemen. Archaeologists say that it may have been a ceremonial pathway to Dún Balor, the promontory fort named after the one-eyed God said to have ruled the island. An Iron Age fort has also been discovered at the eastern end of the island which dates from 700BC. Faith and spirituality has played in the life of the island. It recounts how Saint Colmcille came to the island in the sixth century and established a monastery there. Its remote location was ideally suited to remote monastic life. The ruins of a church founded by St Colmcille, the Church of the Seven Saints, can still be seen on the outskirts of the island’s West Town. The church gets its name from a legend where a boat containing seven holy people, one of them an Indian holy woman, was wrecked close to the island and their bodies were buried beside the church. According to island tradition, the next morning the body of the Indian woman rose to the surface and she was buried separately. The case study also reveals that other visitors came to the island over the centuries. Archaeological finds, including a silver Viking pin, have shown Viking intrusions in the late eighth century. The next historical reference is from 1588 when the Annals record that sailors from the Spanish Armada took refuge on the island. Sheltering the island did not bode well for the islanders as the Annals later recorded that in 1595 George Bingham, Governor of Connacht, ravaged Tory for harbouring the Spaniards. The island was the scene of an other bloody confrontation in 1608 between the O’Dohertys and the O’Donnells and Crown Forces. ROYAUME UNI – Mynydd y Betws - Sandy Gerrard, a former English Heritage designation officer for 20 years, reported the discovery of an ancient stone row on the site of a proposed wind farm in Wales. It seems that the row at the Mynydd y Betws wind farm development went unnoticed by archaeologists researching the site prior to work starting. There are two roads scheduled to cross the stone row but work has now stopped in the area around the row pending clarification by archaeologists working for Cambrian Renewable Energy Limited, the company building the wind farm. Mr Gerrard said that the stone row is probably the most important of the features found and as it is associated with over 30 cairns, some of which are kerbed, it seems to form the focus of an incredibly important ceremonial landscape where the form of space between the numerous earthwork and built elements are as integral and important as the earthworks themselves. 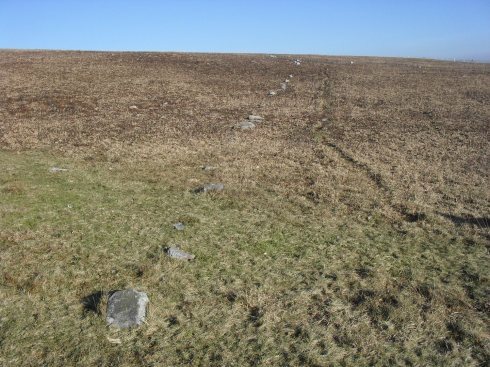 Mr Gerrard has spent much of his archaeological working life on Dartmoor and he believes the form of the newly discovered stone row is so identical to the same rows in England as to suggest a definite and tangible link between these people. The small size of the stones reflects what was available and even on Dartmoor some of the rows are formed by similar sized stones. GPS measurements allowed experts to trace the stone row for 700m. The row is aligned south west to north east which is the most common alignment for South West England rows. ROYAUME UNI – Langcliffe - A new project has been launched to promote the ancient subterranean landscape of the Yorkshire Dales . As part of the project, an exhibition marking the 175th anniversary of the discovery of Victoria Cave at Langcliffe, near Settle, is being set up by the trust and local archaeologist Tom Lord at the Museum of North Craven Life from July this year. The cave was first excavated in 1837 after a local mill worker crawled in and discovered a treasure trove of ancient artefacts including coins and pieces of metal. Large scale excavations followed in the 1870s giving rise to the present cavernous entrance. The site is now considered to be of huge scientific and historic importance, detailing life in the Dales over the last 600,000 years. Archaeologists believe among the cave’s former occupants were a pack of hyenas more than 140,000 years ago when the region enjoyed a sub-tropical climate, a group of brown bears some 50,000 years ago, and more recently the Brigantes tribe in pre-Roman times around 2,000 years ago. JAMAIQUE – Mona - A construction worker has discovered bones on a site close to the new Basic Medical Sciences Complex at the University of the West Indies (UWI) Mona. Archaeologists at the UWI Mona are now carrying out investigations and documentation at the site. Given the proximity of the site to an area known to have been the Papine slave village, it is believed that it may have been a burial ground related to the free or enslaved labourers. However, further analysis is necessary to establish the date of burial and identity of the individuals interred. The UWI, Mona says all the necessary precautions are being taken to respect the area, as far as is possible, and to avoid further disturbance to the cemetery. USA – Gallows Hill - An ancient spearpoint was found at an excavation site off Gallows Hill Road during a Norwalk Community College-sponsored archaeology dig. The excavation at Gallows Hill Rd. has been a 10-year project by Mr. Wiegand and his students. "The point type is the first of its kind found at the site," he said. "It is one more clue to tell us as to who was there." The artifact is being kept with other findings from the Gallows Hill site, where dig will continue when Mr. Wiegand and his students return in the spring. Daniel Cruson, a local historian and archaeologist, said the spearpoint finding is not uncommon for this area. 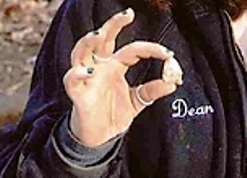 During several digs at Putnam Park Mr. Cruson has headed since 2001, a component of an Indian camp was uncovered along with other findings. "We found a complete projectile point, six or seven broken points and stone bifaces made of quartz," said Mr. Cruson. These findings also date to between 4,000 and 5,000 years ago. JAPON - Kashihara City - A team of Japanese archaeologists has found a piece ofpottery painted with the face of ogre which dates back to the 12th century in NaraPrefecture in western Japan. The earthenware was excavated from a well built in the early 12th century at Shindo Remains in Kashihara City, Nara Prefecture, where once Japan's capital was located. The excavation team said that the pottery is round shape with about 10 centimeters indiameter, noting that a face of ogre was drawn on its surface in ink. In particular, theteam stressed, bold lines are clearly shown for his eyes, eyebrows and tusks from hismouth, making the face quite humorous and impressive. It is believed that the discovery of pottery is the first time in Japan. The team started the excavation in June 2010 and also found in the same site otherpieces of pottery which seem to be used as dishes or saucers for ritual ceremony in theera. Japanese archaeologist Shinichi Sagawa in Gangoji Institute for Research of Cultural Property was quoted by NHK as saying that it was widely believed during the MiddleAges, possibly by legend from China, that picturing or imaging of ogre was one of thepopular methods to protect people's daily life from enemy, evil and illness.